Home » Blogs » Charles Gaba's blog » The Return of the Incredible Shrinking Premium Increase! 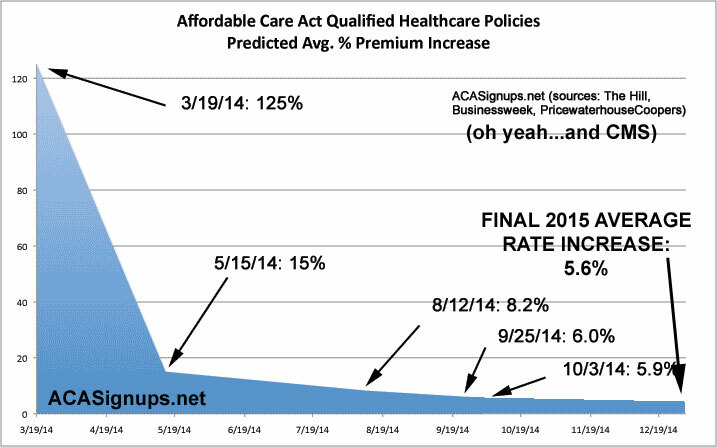 Well, that was all before the 2015 ACA exchange policies actually kicked in. Today the Robert Wood Johnson Foundation released a new study which breaks out what the actual rate increases were from 2014 to 2015. Because the lowest-cost silver plan in each area offers the least expensive entry to the marketplace into the most popular tier of coverage, and the silver plans are those to which the financial assistance is pegged (and the only ones for which cost-sharing reductions are available), we focus our analysis on these. We provide data on the lowest-cost silver plan in each year and the relative difference between the two. Silver plans enroll the largest share of marketplace enrollees: 65 percent of individuals who selected a plan.7 The lowest–cost and second-lowest-cost silver plans are the most popular.8 The lowest-cost silver plan in 2014, however, may not be the lowest-cost silver plan in 2015; the two plans can frequently be offered by different insurers.9 In such cases, a consumer wanting to choose the lowest-cost silver plan in each year would have to change plans and presumably provider networks. In other words, today's study appears to represent well over half of the 11.7 million total enrollees on the exchanges (OK, more like the 10.4 million who are actually paying their premiums and fully effectuated, anyway). So, after all the fuss last year, what ended up happening? In this paper, we examine marketplace premium changes between 2014 and 2015 in all rating regions in all states and the District of Columbia. We provide premium data on the lowest-cost silver plan within each rating region for a 40-yearold individual who does not use tobacco.1 We calculate that the population-weighted national average premium increase in the lowest-cost silver plan offered in each year was 2.9 percent. Increases varied considerably both across rating regions within states and across states. The change in the population-weighted average premium in the lowest-cost silver plan offered in each year was 1.8 percent in the Northeast, 3.5 percent in the Midwest, 5.4 percent in the South and 1.4 percent in the West. Approximately 70 percent of the population of the West and over 80 percent of the population of the Northeast reside in rating regions where the lowest-cost silver plan premiums either fell or increased less than 5 percent. Almost 60 percent (59.3 percent) of Midwest residents live in rating areas where the lowest-cost silver plan premium either fell or increased less than 5 percent. Will that hold for 2016, 2017 or beyond, as the insurance company "rate corridors" and related rate-dampening provisions time out? Who the heck knows...but that still won't change the fact that countless ACA critics were breathlessly claiming insane rate hikes of 40, 50, even 100% or more this year...all of which proved to be a big pile of hooey (with a handful of exceptions...the only state to come even remotely close to this was Alaska's 28.4% hike).